Display your love of birds and help them thrive by adding this Whitehall Hummingbird Sundial Bird Bath and Roman Pedestal Kit to your garden. This vivid package combines a sundial, bird bath, and lovely stand for a fantastic addition to your landscaping. The 12.25" diameter, Whitehall Aluminum Hummingbird Sundial Bird Bath creates a lovely resting spot for your favorite backyard birds, and its 1" deep basin offers them plenty of preening area. A 1" wide lip around the bath not only provides birds perching spots; it also houses Roman numerals from 5 AM to 7 PM to create a sundial. The included, ornate twig shape attaches to the center of the bath and forms a gnomon, casting its shadow over the time when oriented celestial north. The trumpet flower, leaf, and hummingbird figures on this gnomon further the theme, and the verdigris accents and copper colored finish provide contrast. Attach this piece to the included Whitehall Aluminum Roman Sundial Pedestal, for a dramatic centerpiece in your garden. The fluted design of this stand enhances its classical theme, while an 8" diameter base with braided detail provides support. Use the included hardware to secure this pedestal into concrete or stone, or use pipe (not included) to keep the display stable in your lawn. The aluminum construction of both pieces withstands exposure to the elements for many seasons, and their copper colored finish and verdigris accents offer an aged effect. 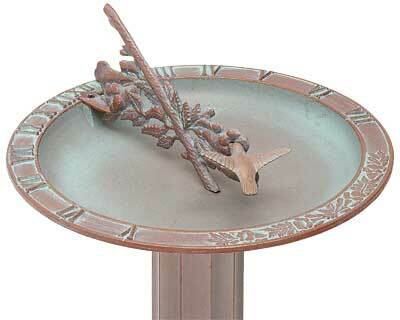 Lend timeless style to your landscaping with this Hummingbird Sundial Bird Bath and Roman Pedestal Kit. Assembly required. Made in the USA.